I tend to be rather cautious about grand theories connecting everything to everything. So I wanted to look very closely at a new study arguing that “America colonisation ‘cooled Earth’s climate’” . This winter researchers from the UK report evidence that the “Great Dying” in the Americas following European contact caused a period of global cooling . Following the contact and invasions of the early 1500’s, vast numbers of Americans died from European diseases, particularly in the Caribbean, Southeast US, Central America and Northern South America.. This depopulation had crippling effects on the social, political, and economic lives, and left the people open to relatively easy conquest. The new paper seeks to estimate the ecological effects of this massive tragedy. Specifically, the sudden disappearance of the human inhabitants led to large areas of land reverting from agriculture and other human uses to regrown forests. In short, the paper interprets this as an accidental episode of mass reforestation. Coinciding with this era, analysis of ice cores indicates a drop in atmospheric CO2, and historical records document a cool period, the Little Ice Age. Are these events connected? This hypothesized connect involves a chain of connections. First, the pre-Colombian population would have to be large enough, and use enough land for the dieback to have an impact. Second, the dieback and putative reforestation would have to be large enough to account for the uptake of that much CO2. The study musters evidence for these factors, and models the probably effects on climate. There are limited historical records from the pre-Colombian period, and no population censuses. However, many methods have been used to estimate the populations of the Americas from archeological remains. Combining these estimates, this study finds the population to be something like 60 million people (which might have been about 10% of the world’s human population). Other studies have estimated the amount of land used to support these populations. These estimates are difficult to make precisely, because they rely on assumptions about not only populations, but also agricultural and cultural practices. This study proposes that the total land under human use was about 50 million hectares (about the extent of France or Texas). The Great Dying was a massive disaster for the American peoples, but estimates of the magnitude of the disaster vary. This study considers a number of studies and takes the median of the estimates: which is 90% death rate! This would make the post contact (circa 1600) population about 6 million people, which is at the low end of previous estimates. Finally, when there was a depopulation, the land use reverted to forest. Obviously, this process is specific to different locations. In some locations, there is evidence of the reduction of fires, which may be due to the end of intentional burning. Archaeological pollen indicates that some areas had significant reductions in cultivated plants at the time of the die off. There is also archaeological evidence of abandoned settlements and apparent agricultural and other infrastructure. These estimates rely on a variety of assumptions and imperfect data. The total abandoned land is higher than some estimates, but roughly in the midst of other estimates. So, if 50 million hectares reverted to forest in a relatively short period, what might the effect have been? The researchers indicate that carbon uptake increases rapidly in the first 20 years of such a transition, and slower after that. With plausible estimates for different areas, this study yields an estimate of about 7.4 petagrams of Carbon sequestered in the abandoned lands. This is higher than some estimates, partly because it depends heavily on estimates of the population loss and corresponding area of abandoned land. At the end of this long chain of inference, the estimated Carbon uptake corresponds to a decrease in atmospheric CO2 of 3 ppm or more. Data from many studies shows that there was atmospheric cooling coinciding with the decreased atmospheric CO2, indeed “1577-1694 CE is the only period of significant global cooling within the past two millennia”, and is recognized as “the Little Ice Age”. This cooling is in alignment with theoretical models of the effects of decreased CO2. The researchers find that is no evidence for similar changes in total solar irradiation or volcanic aerosols during this period. Altogether, the study concludes that the Little Ice Age was probably caused by the depopulation of the Americas and corresponding changes in land use. This result, if sustained, is an interesting perspective on the complex world-wide effects history of the European invasion of the Americas. It is already known that the transfer of species (e.g., food plants) changed diets and health. It is also known that the massive transfer of precious metals, particularly silver, generated substantial inflation throughout Europe, and increased trade between China and the world. If the American genocide triggered or exacerbated the Little Ice Age, then its indirect effects included bad weather and famine in Europe and elsewhere, with concomitant social stress and unrest. Karma, anyone? This is a fascinating study, connecting two obvious dots with a line through a variety of evidence. (I’m a big fan of using multiple lines of evidence.) They make a plausible case. We’ll have to see how well this holds up. There are competing hypotheses, starting with disagreements about the supposed dating of the “Little Ice Age”. And while 1492 is pretty firmly dated, the course of contact and depopulation (and subsequent population increase from European immigration) are far harder to date because they occurred over the whole western hemisphere for several centuries. In addition, estimates for the pre-contact populations and land us are uncertain, as are the estimates for the magnitude and pace of the die off. In short, refined estimates for these factors could change the conclusions. And, of course, the climate models used to connect the dots from depopulation to cooling are uncertain. However plausible the hypothesis, there is a huge amount of uncertainty in the argument. Nevertheless, this study certainly lays out an interesting case. The Little Ice Age does not seem to have a clear cause. And the Great Dying was a once-in-history “cause”, potentially of just the right magnitude. If there isn’t a connection, it’s a hell of a coincidence. The authors also point out that the scenario in this study gives perspective on current preoccupation with reducing atmospheric CO2 . This was a massive unplanned reforestation (of an area equivalent to all of France) which had a strong, almost immediate effect on the atmosphere and climate. That’s good, but only a drop in the bucket compared to current emissions of Carbon. It’s going to take a heck of a lot of reforestation to put a dent in our current situation. One of the most interesting discoveries of my life time has been the existence of exotic life forms on Earth, including extremophiles, which thrive in environments that our own relatives cannot tolerate at all. With every year, we find life everywhere on this planet, both side-by-side with “normal” life (e.g., living in our mouths) and in “impossible” places like hot springs, under ice caps and underground. These days we are very concerned with getting a handle on the Earth’s Carbon inventory, because we Homo “sapiens” have been dumping huge amounts of Carbon into the atmosphere, with potentially dramatic effects. It’s a bit late, but we’d like to know where Carbon is and how it moves around absent the gormless actions of humans. So it is extremely interesting and important to find out just how much of this extremophile life there actually is. This fall researchers form the wonderfully names Deep Carbon Project report a new estimate that something like 10^29 cells live in the Earth’s crust. (Actually, the new estimate is for life under continents, but the new estimate is in the same ball park as previous estimates of undersea crust.) That’s right, in rock and underground water and whatever. This is a big number—ten times the population of the world’s oceans, for example. Obviously, life is different down there than on the surface. No sunlight, but a lot of heat. Pressure and dense, solid materials. And who knows what else. By our parochial standards, it’s rough, not to say fatal. Nevertheless, they persist. There are so many interesting questions. For one thing, just how are these guys related to our surface loving relatives. Obviously, we all evolved at the same time on the same planet. But do we migrate and interact upstairs and downstairs? Did life start below and migrate up, or at the surface and migrate down, or both? And, for that matter, how does underground life reproduce and move and who eats who (and how)? Of course, the big story is that this planet is absolutely saturated with life, even deep down. Among other things, this suggests that other planets and moons could be saturated with much more life that we have suspected based on surface conditions. If microbes can live deep in rock here, then they could live deep in the rock on Mars, or even Venus or other places. Who knows? These estimates also tell us that a whole lot of Carbon is sequestered in these species. The good news is that human activity probably isn’t having much effect on these guys. We may be screwing up the surface, the atmosphere, and the oceans, but we’re not really harming the crust (yet?). This means that life on Earth will probably survive the big Anthropocene die off, at least underground. The bad news is that even messing with a tiny fraction of biosphere, we seem to be pushing the surface to significant changes that will not be good for those of us living on and near the surface. Even if vast amounts of Carbon are sequestered underground, that apparently isn’t going to save our skins. Life may survive, but we are working hard to kill ourselves and all our closest biological relatives. So cool! This makes me want to take up biology! It’s December, so it’s time for the AGU! (The American Geophysical Union Fall Meeting ) That means lots of splashy research results. One of the reports from NASA indicates that the East Antarctic glaciers are “waking up” . This sinding is important because we know that West Antarctic glaciers are moving and generally look to be thinning. But there had been little indication of such changes in East Antarctica, as well. Uh, oh. The new study using satellite and other data shows that quite a few of the EA glaciers have accelerated in the past few years. This is similar to the trends from other parts of Antarctica, so it can’t be too surprising. And it also means that pretty much the whole continent is melting. 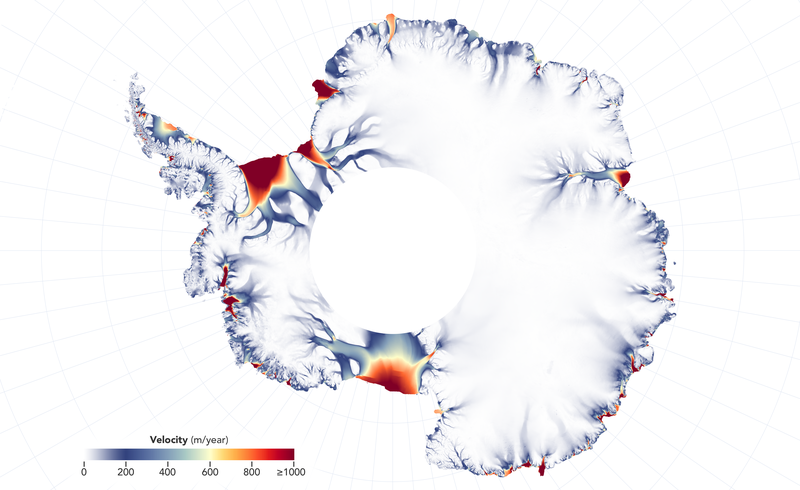 With the Northern ice rapidly shrinking, and mountain glaciers receding everywhere, Antarctica round out the picture of a rapidly melting cryosphere. In a century, the concept of a “cryosphere” of permanent ice will be a nostalgic memory. Not that there will be very many human’s around: “There is enough ice in the drainage basins in this sector of Antarctica to raise the height of the global oceans by 28m.”  Glub. The Japanese/ESA Hayabusa2 A asteroid probe is on station and mapping Ryugu, and has already dropped three surface probes, in preparaton for a touch down to collect a sample, a cool “penetration” probe, and then return to Earth starting in 2020. Meanwhile, the NASA OSIRIS-Rex probe has caught up with and taken station at it’s target asteroid, Bennu . The spacecraft will map and measure Bennu close up, and will observe the Yarkovsky effect there. Out there, things move at a stately celestial pace, so it will be a while before OSIRIS-Rex drops in to scoop and sample, and they ultimately returns in 2021, to arrive in 2023. If these efforts succeed, we should get not one but two asteroid samples circa 2022. Not one, but two asteroid return missions! Cool! As the ice melts all over the Earth, particular attention centers on Antarctica. If and when the Southern ice cap melts, the oceans will rise by tens of meters, drowning much of where humans live. When will this happen, if ever? We need to know. Antarctica is a continent, and that means it is big and complicated. Some places are melting fast. Others aren’t changing much, and some may actually be accumulating more ice. One of the unknowns is what is under the ice. We can easily see the top of the snow and ice (at least some of the time.) But what is going on in the kilometers deep ice, and what is at the bottom? The is actually a critical question for several reasons. Ice that is resting on dry, cold, rock will be solidly anchored and will generally melt only where exposed to air and ocean. But ice resting on water will melt and slide downhill, generally ending up in the ocean, where it will melt. And ice resting on warm rock will melt from below. In Greenland, there are areas where volcanic heat under the ice is thinning and weakening the ice, and speeding the rate of melting. This fall, researchers from Europe report on studies using airborne ice penetrating radar near the South Pole . The study identifies an area that is a geothermal hot spot under the ice, where the overlying 2+ km deep ice cap is sagging. The saggy spot is approximately 100 x 50 km, and the sag is consistent with melting of about 6 mm per year. This seems to be much more than would be expected from the rocks, so the researchers suggest that there is geothermal flows of hot water from deeper rocks. This finding is important for numerical models of the ice, which generally use a uniform, lower estimate of the heat of the rocks. This hot spot, and other similar anomalies could have substantial effects on the changes to the ice cap. And, as noted, in this case the estimate is much higher—more than twice as high—as previous estimates. It is noted that these results may explain the presence of numerous subglacial lakes in that area. The details of the techniques are beyond my own paltry understanding of either ice or radar. Given the complex dynamics of the ice cap, there will need to be additional studies and cross validation to make sure these estimates are accurate. These results will also guide ongoing plans to sample the ancient ice from this area. It is thought that this area has some of the oldest ice on the planet, and examination of embedded air bubbles would reveal a history of climate far into the past. However, the ice in this warm, sagging zone will have remelted and would not retain the ancient bubbles. So the search for records of the climate should avoid these areas . I love whales, though I rarely get to see any out here in the corn fields. The giant cattle of the sea are seriously threatened by the multiple effects of swarming humans, so it is important to learn as much as possible about them. But it isn’t easy to observe and track individual animals in the wide blue ocean, so we have little solid information about how many whales live where. Researchers at the British Antarctic Survey report this fall studies that demonstrate the ability to track individual whales from satellite imagery . The technique uses imagery from the Worldview-3 satellite, which can deliver images of the ocean with sub-meter resolution. At this resolution, it is possible to discern whales swimming on or near the surface with enough detail to understand some of the behavior of the whale. 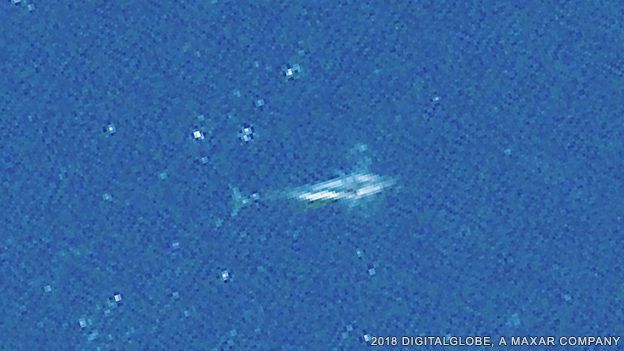 For example, at this resolution a whale’s fluke occupies 6-10 pixels—which opens the possibility of identifying individual whales in satellite images. The study developed automated recognition algorithms to pick out four species of whales and ignore boats and small aircraft. The study manually identified whales and non-whales in sample images. The study found that spectral features from the image could be used to automatically identify whales, and distinguish them from non-whales. The paper notes that whales are easier to detect when swimming parallel to the surface, but much harder to identify in other behaviors. They also note that the coloration of different species makes them easier or harder to detect in the water. This work could lead to automated an automated scanning system, perhaps coupled with crowd sourced human scanning. The research plans to follow up with a detailed survey of the Ligurian Sea protected area . I have to be a little worried about this research. If researchers can do this, then anyone can. (Note that this uses purchased commercial imagery that is available to anyone.) The last thing our cetacean friends need is for hunting ships to have real time tracking satellite data. As the Anthropocene climate changes accelerate, we are seeing life forms (with the exception of humans) responding to the changing conditions. Animals are moving uphill and northward, following the warming trends. At the same time, plants are “migrating” and adapting. Oak trees and other species are “moving” north, inhabiting areas that were previously too cold, and dying out in over heated southern ranges. Even in polar regions, the inhabitants are adapting to the melting ice and warming air. Penguins seem to be shifting nesting grounds, presumably following changing conditions. This fall two studies report on how the plant (or at least non-animal) life is “moving” in the Arctic and Antarctic. Until recently, some areas of Antarctica had large areas of moss that was covered by snow and ice in the winter. In the summer, the cover melted these beds were exposed to the sun. In this very wet, very sunny situation, the moss greened and thrived. In fact, the beds seem to have persisted in the same location for years, probably centuries. These are the “miniature old growth forests” of East Antarctica. They are also home to many (small) animals and other species such as fungus. A new report shows that some of these beds are rapidly dying out, apparently because the climate is drying out . (Growing moss is all about water.) Other more tolerant mosses are invading the area. Tiny as they are, this rapid change to the “moss forest” is a huge ecological shift. At the same time, another study reports that in northern regions tundra plants such as grasses have grown taller, and larger species are moving north . In fact, getting on twice as tall. There are no trees in these harsh locations, so these ankle high species are the “miniature old growth forests” of the tundra. And they are bulking up in response to warmer, wetter conditions. The presence of these taller plants might create a positive feedback, insulating the soil (e.g., by trapping blowing snow) and lowering the albedo (due to foliage sticking above the snow). These effects could contribute to more melting of ice and permafrost, further warming the area. Not only are the old growth forests shrinking and dying, these “miniature” old growths, mosses and grasses and such, are also changing rapidly. It’s kind of a cool image, “miniature old growth forests”.